Adam Sandler is back with yet another fairly descent comedy. 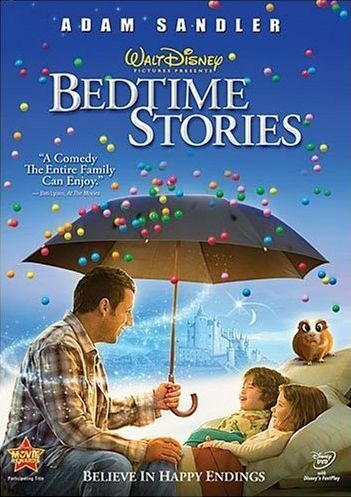 This one is called Bedtime Stories, and while I don't think it was as good as some of his previous films such as Happy Gilmore or The Waterboy, it defintely had some laughs and some charm, and held my interest. So this time around, Adam plays Skeeter who is the handyman in large hotel called Nottingham Hotel. Originally, the place was a small time motel owned by Skeeter's dad, where young Skeeter's imagination ran wild, but unfortunately he couldn't make enough to keep the place, and ended up selling it to a man by the name of Barry Nottingham. A stipulation of the sale, however, was that Skeeter be put in charge of running the hotel once he was old enough to do so, but since here we are now with Skeeter being just the handyman of the place, obviously something went wrong. You might think that it's because they guy is evil and manipulative, but in truth he simply forgot, and Skeeter isn't ambitious enough to step up and remind him. As luck would have it, Mr. Nottingham then announces that the time has come to build another hotel, and Skeeter believes he is finally going to get his chance to run a hotel. However, his spirits are crushed when Nottingham announces his future son-in-law will be taking over for the retiring manager. This leads into the meat of the story, which comes in when Skeeter's sister Wendy needs him to watch her two kids, Bobbi and Patrick, while she leaves town for a job interview, due to the fact that the school (at which she is the principle) is being closed down. For some reason, Wendy is the total opposite of her brother, and is one of those crazy people who thinks that anything enjoyable is bad for you, such as eating beef, or sugar, or watching television. And thus, Skeeter can't just park the little angels in front of the television, he actually has to play games and what not, which helps them bond. LOL, did I just make that sound like a bad thing? When bedtime finally arrives, the kids want a story, but Skeeter can't stand the boring politically correct books they have, so instead he just makes up a story, with a little help from the kids. It's a story, set in ancient days of castles and kings and knights on horseback, with Skeeter cast in the role of a peasant named Sir Fix-a-Lot and tells the story of how he was looked over by the king in favor of Sir Butkiss, mirroring the events in his own life. And since he's bummed, the story doesn't have a happy ending. But gosh darn it all, the kids want a happy ending, so they change the story to have the king give Sir Fix-a-Lot a chance to prove himself... and then for no particular reason they say it starts raining gumballs. Skeeter doesn't get the story a second though until the next day when events begin to occur which mirror the bedtime story, such as gumballs raining from the sky and Mr. Nottingham giving Skeeter a chance to prove himself worthy of running the motel. So now he's like blown away, and can't wait to for bedtime to get another story going. This time, he sets it in the old west, and has a horsekeeper give him a free red Ferrari, which is, as you might expect, a red horse. They kids then have him save a damsel in distress, but afterwards, when he wants to "get the girl" so to speak, the kids have other ideas for how the story should end. The next day Skeeter is on the lookout for his free Ferrari, but when things go wrong, it's not long before he realizes it's the kids' contributions to the story that come true, not his own. So now with the few remaining days he has left with the kids, Skeeter must try to direct their imaginations to get himself everything he's ever wanted, though this is easier said than done as children can have some wild imaginations! Plus, he may just find out that getting everything he ever wanted is possible just by caring and putting forth a bit of effort. The story was sweet, the kids were adorable, the antagonists were arrogant and selfish but not really evil, and the character of Skeeter was well played and grew over the film as one would expect, but at times the plot seemed forced in order to get where they needed it to go, and there really was never any explanation as to why the children were able to make fantasies come true. Was their dad an alien or something? I didn't really get the character of Bugsy, the big eyed guinea pig, as he seemed there just to get a laugh now and then, not to really help the story along. The best parts of the film were definitely the bedtime story sequences, but it was also neat to see how the events in the story would translate over into Skeeter's real life. Overall, it was enjoyable. Until Gravity Do Us Part - a short 4 minute long behind-the-scenes look at how they did the weightless scenes in the bedtime story that's set in space. To All the Little People - a short 5 1/2 minute long behind-the-scenes look at working with the two kids, Laura Ann Kesling and Jonathan Morgan Heit. It's Bugsy - a short 3 1/2 minute look at Bugsy, a guinea pig in the movie that they gave really big eyes for some reason. Cutting Room Floor: Deleted Scenes - 12 deleted scenes which total about 11 minutes... most were good decisions to cut. Dylan & Cole Sprouse: Blu-ray Is Suite! - basically just a 6 minute advertisement for Blu-ray. Bedtime Stories , released by Walt Disney Video, is available starting April 5, 2009.